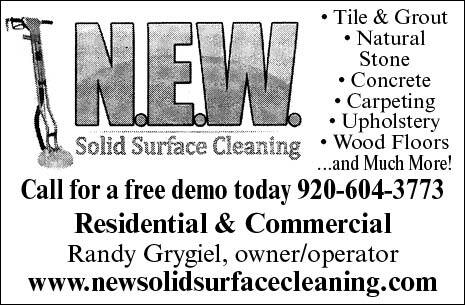 NEW Solid Surface Cleaning is a fully licensed, certified and insured company cleaning carpet, upholstery, wood & vinyl floors, tile and grout floors serving Green Bay, Pulaski, Oconto, Oconto Falls, Shawano and all of the Northeast Wisconsin area. Our goal is to provide our customers with astonishing service and the best investment in cleaning and restoring all surfaces. With NEW Solid Surface Cleaning there are no surprises & no hidden charges. We'll clean your floor or hard surface like it has never been cleaned before!